Biotechnology and pharmaceutical companies have seen a rapid growth in clinical trials, thanks to major advancements in drug discovery and novel ways of targeting and combining various technologies including immunotherapy and gene therapy. KPCB’s Mary Meeker’s Internet Trends 2017 reports that the number of clinical trials has grown by over 10 times between 2006 and 2016 and the number of publicly available clinical trial results has grown from 1.9K to 25.4K between 2009 and 2016. There is also a marked difference in how generations access the ever growing healthcare data. For example, millennials own wearables, go online to find a physician and select providers based on online reviews at a significantly higher rate than Gen X-ers and Baby Boomers. The newer generations’ behaviors with respect to devices, voice interfaces and messaging platforms are also becoming profoundly different. Companies conducting clinical trials are finding it increasingly difficult to find and enroll patients, especially in the United States and other developed countries since drugs get approved first in these countries resulting in reduced wait times for patients and not having to resort to experimental drugs. Moreover, physicians tend to have limited time with patients and in order to describe the benefits and risks associated with an experimental drug limiting the opportunity for potential participants from getting all their questions answered. We believe that an AI/NLP-based, well trained and trainable text and voice-based conversational chatbot would address these challenges. 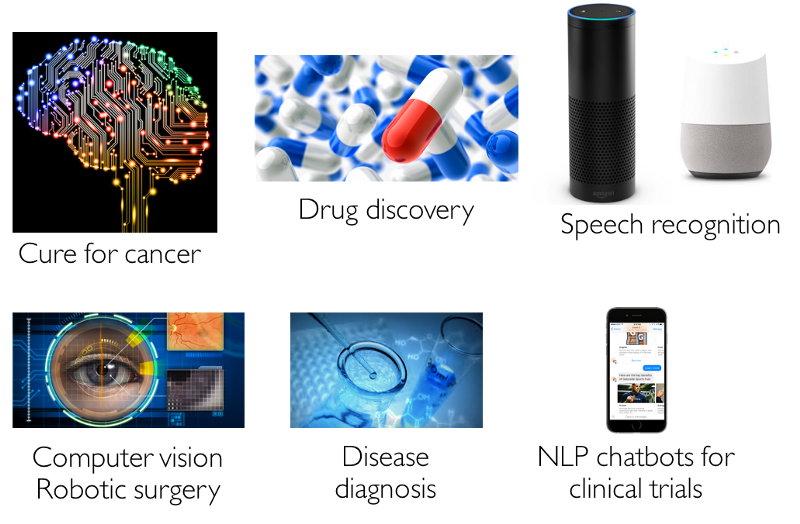 Support over multiple platforms such as the desktop or mobile web, messaging platforms such as Facebook Messenger, WeChat and voice assistants such as Amazon Echo and Google Home would enable vast coverage and frictionless and ubiquitous access for patients. Recently, several HIPAA compliant messaging platforms and applications have sprung up, which ensure regulatory compliance of healthcare data. Clinical trial sites can mandate the use of one or more such apps, for instance, and if the chatbot can work over these apps, while integrating seamlessly with other electronic medical records (EMR) systems through webhooks such as REST APIs (Representational State Transfer Application Programming Interfaces), the resulting solution becomes a very powerful and an effective communication tool. The patients and potential patients would like to get trial questions answered quickly before recruitment, be made aware of their options, get questions answered including the Informed Consent Form (ICF) over the course of the trial and have the ability to access these from multiple platforms seamlessly and get reminders for appointments and tests. Using push notifications, the CRO/clinical trial site can send reminders to the patients such as medication schedule. In addition, patients can upload compliance information such as confirming medicine intake, what they ate during relevant meal times and recording any other pertinent information. By offering a universal and easy access, patients are more likely to provide compliance information, which would make the clinical trial results and analysis more accurate. The clinical trial ecosystem consists of the pharmaceutical company, contract research organizations (CROs), trial sites and a potential pool of patients. The pharmaceutical companies are keen on increasing recruitment and coverage of trials, containing the growing cost of doing trials (especially in the US), educating Investigators and site staff about the research/experimental drug and improving patient experience (including healthy volunteer trials). The CROs are looking to increase recruitment effectiveness and reach, reduce the cost of doing trials and improve communication with site staff. The investigators and site coordinators want to solve the problem of investigators getting only limited time with patients, increase recruitment effectiveness, remind patients about upcoming appointments and make trial information more accessible for patients and track compliance. An AI-based conversational interface offers a sure remedy.